Ever heard of a flibbertigibbet? What about a blatherskite? Historic terminology for people who indulged in chat was hardly flattering. Today, however, that contempt has changed alongside the very concept of chat. No longer is chat viewed in a negative light, and no more does it even pertain to verbal exchanges. Chat is friendly, comfortable and fun. Perhaps even more surprisingly, it’s predominantly digital. From folly to fad to formal business communication format, chat has come to be recognised as one of the best ways to interact. So, what caused this widespread perception change, and how did chat dominate the customer service channel mix? Historically, chat wasn’t viewed highly. In fact, the historic perceptions of chat saw the practice as a low-intellect and frivolous communication form. Old terms for chat include words we’d never use today: twaddle, clack, claver, jaw. These words carried with them connotations of idleness, triviality and folly. ‘Twaddle’ is now another word for nonsense, ‘clack’ is a series of sharp sounds, and neither cast chat in a particularly positive light. Back then, ‘chat’ had no place in a professional customer service interaction. Chat was for gossips and people that parroted conversation thoughtlessly, not for business exchanges. In fact, the overall historical perceptions of chat were of silliness and time wasting. The invention of the telephone in the 1890s set the course of chat in a dramatically different direction. Before, people would have to spend time waiting for a letter reply, or travelling to meet their conversation partners. The time investment meant that conversation needed to be as efficient as possible. Technologies like the telephone and radio, however, closed that distance and time gap. Real-time conversation with anyone – not just those stood in front of you – suddenly became accessible. Conversation became quicker; less constrained. Importantly, chatting started to become something you might do through a device. Chat was evolving into a technical luxury; a cool new way to communicate rather than a time-wasting triviality. And it wasn’t only friends you might chat to: technology had also opened the door for real-time chat between companies and their customers. Slowly but surely, chat was moving from a solely social affair to include communication with businesses. It wasn’t until the early 90s that perceptions of chat truly shifted towards the digital. The decade’s technological advancements saw chat re-defined entirely, relating to the electronic, instant and integral part of our lives that it has become today. 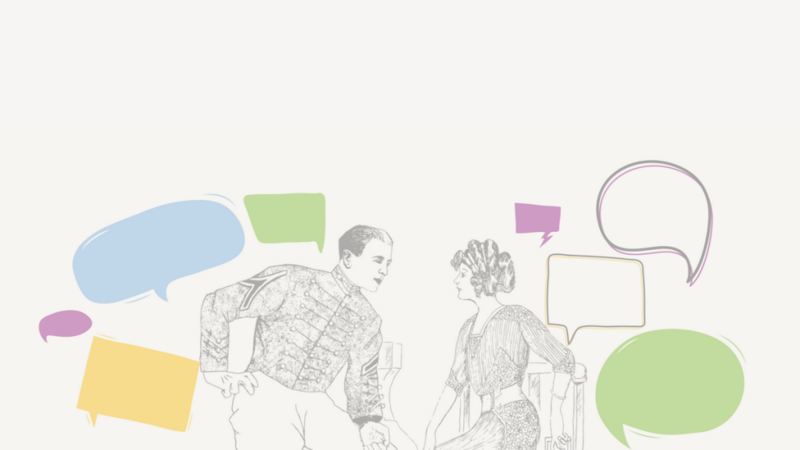 With the birth of computing and the internet, historic perceptions of chat were transformed. The invention of the World Wide Web by Sir Tim Berners-Lee enabled international communication, placed at the fingertips of anyone with a computer. Chat came to relate to electronic communication, with connotations of speed and informality. With this shift, new, positive perceptions of chat became mainstream. Chatrooms, and later, instant messaging, exploded. Unlike the telephone, internet enabled chat was inexpensive and unobtrusive. Instead of worrying about cost restrictions, chat provided a form of instant gratification with no clear downside. Social media grew, and more and more people embraced online chat. Now, if someone mentioned ‘chat’, your mind would leap to instant electronic communication – cool, fun, and no thoughts of flibbertigibbets. Smartphones and widespread internet access made it possible to engage in chat spontaneously. The relaxed, informal and instant nature of the activity made it perfect for friendly communication. Brands were quick to recognise the demand (and business benefits) of chat. With this business attention, chat continued to evolve. Live chat software became the next manifestation of chat, with customers communicating instantly with companies at the click of a web button. Indeed, the instantaneity of chat set new customer service standards. Customers grew to expect immediate online assistance, making chat channels a necessity for any online business. Software solutions that enable brands to cash in on the popularity of online chat have helped close the communication canyon between businesses and consumers. Live chat software provides brands with not only a friendly, conversational voice, but a popular method of communication that meets customers where they are. Once again, the perceptions of chat evolved alongside the technology that powered it. The next step for chat is evolving as we speak. As instant responses become the expectation, chatbots are increasingly joining our conversations. Far from being warned against in etiquette of old, chat is now encouraged even between us and our inventions. The perceptions of chat have certainly evolved with technology. History’s perceptions of chat might have seen it as dull and endless, but they were only half right. As we continue to strive for instant, widespread communication, we are starting to see the ways in which chat truly is endless. Now we are all happily a bunch of online flibbertigibbets. Still yet to test out a chin-wag option on your website? Try our 30-day free trial of WhosOn, and embrace today’s positive perceptions of chat.